Daniel Egielman has participated in over 20 competitions. The following are the most important ones in which he won prizes: Sanremo (IT) Premio Casino di Sanremo, Tychy (PL) Silesian Guitar Autumn, International Guitar Festival Nürtingen (DE), BIGC in Brussels (BE) , „Michele Pittaluga“ in Alessandria (IT), „Alirio Diaz“ in Rust (AT), „Jose Tomas“ in Villa de Petrer (ESP), „Andres Segovia“ in Velbert (DE), „Forum Gitarre“ in Vienna (AT ) and „Anna Amalia“ in Weimar (DE). 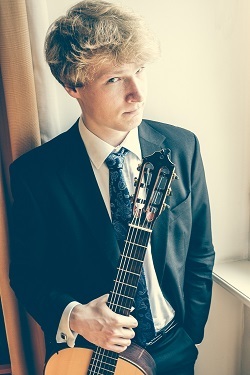 At the Nürtingen Guitar Festival 2016, he was awarded the second prize in addition to the Audience Award. He began his musical career at the age of seven. In 2013 he graduated with honours from the Feliks Nowowiejski Music School in Gdansk. Since 2013 he is studying at the Mozarteum in Salzburg with Prof. Marco Tamayo. Despite his young age, he has played concerts in most European countries and China and has been a guest at international music festivals in Torino, Brussels, Alessandria, Poznan, Szczecin, Olsztyn and Żory. For his achievements Daniel has been awarded numerous scholarships by the Polish state. Since 2013, his studies at the Mozarteum have been financially supported by the President of the City of Gdańsk. Since 2017, Daniel is ambassador of the Chinese guitar brand „Gomera“ and is sponsored by the French guitar string maker Savarez.